Reaching your 1000th flying hour is an achievement for any Naval Aviator but to do it whilst deployed on operations, having successfully disrupted three Pirate Action Groups and seized millions of pounds worth of illegal narcotics, will make this particular milestone all the more memorable for Petty Officer Leigh Williams. Captain Nick Hine RN, CO HMS Westminster, stands in centre of Merlin Flight 502 for Petty Officer (Air Crewman) Leigh “Bungy” Williams’ 1000 hours of flying presentation. Photographer ET (WE) Katie Shaw. Petty Officer Williams is a Merlin Aircrewman embarked in HMS Westminster and is a member of the United Kingdom’s 829 Naval Air Squadron. Along with the rest of the frigate’s 200+ Ship’s Company, he left the UK in January to embark on operations east of the Suez Canal to serve with Combined Maritime Forces (CMF) in this strategically vital part of the world. Much of the deployment has seen Westminster conducting maritime security operations; especially in the counter-piracy and counter-narcotics fields. This activity is part of CMF’s primary mission to disrupt piracy and deter illicit maritime activities thus protecting those who use the seas for legitimate activities. Petty Officer Williams and HMS Westminster are due to return to the UK in August after seven months away. 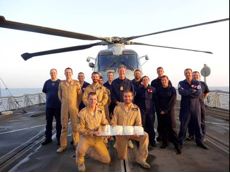 His achievement was marked with the traditional presentation of a cake and a bottle of champagne by Captain Nick Hine Royal Navy, Commanding Officer of HMS Westminster.